First Baptist Church of Oakville had its beginning on October 25, 1959. A group of dedicated believers in the New Testament faith met in Lloyd Miller’s home to discuss the beginning. There was no Baptist Church in the Point-Oakville area at that time, and a need was seen and challenged. Permission was granted, and the church was organized with 78 charter members. Rev. Andrew J. Smith was called as pastor. This organization took place in the Mehlville Jr. High School. Mr. and Mrs. Buel Clendenin allowed us to use their home at 123 Tansberger Drive for a time, but his was too small and we had to have some additional adult classes in other homes in the area. 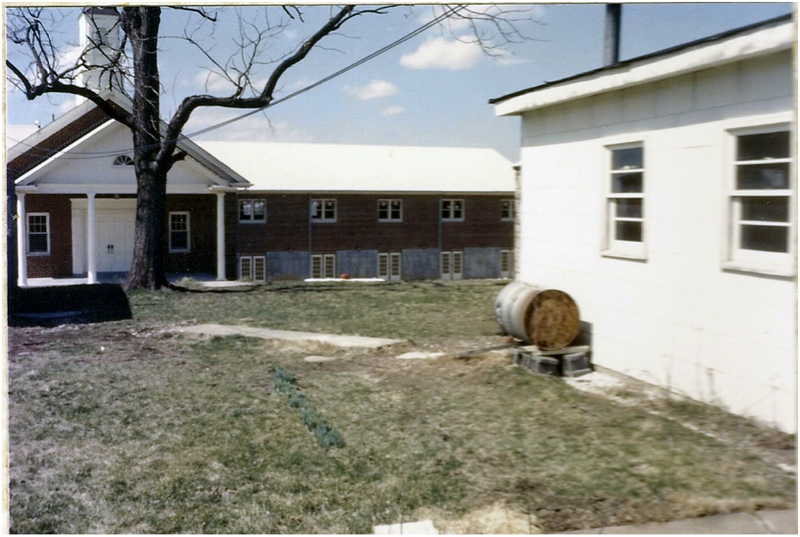 This is the side of the old farm house where church was held until our present building was built. Pictured are Mrs. Sadler and her daughter, Nancy, Mr. Parks and Mr. Mossberger. The group was moved to the Oakville School for a few months; then the old farm house that was on the property was bought and with a lot of shuffling we managed to have a fully organized church with all its organizations and activities. The first sunrise service was held in the yard of the old farm house with everyone wrapped in blankets to keep warm. Work began by the men and women of the church converting the old house into classrooms. The first year’s budget was $10,982. That was a happy, dedicated group of Christians working together to serve the Lord. It was a short period of happiness, for on November 20, 1960, Rev. Smith chose to go elsewhere to serve, and we were left without a pastor. During the one and a half years we baptized six and our membership grew to 111. Our search for a new pastor began and during the time without a pastor, Rev. Allen, serving as interim, kept us fed and nurtured and very few left. Rev. Don Wideman was called, accepted and began services February, 1961. During those years there were many accomplishments. In May, 1961, a building committee was given authority to secure an architect and present plans for a new building. Floor plans were adopted in August and $53,500 in ABC bonds were sold in one evening in October, making us realize how God can work through people, a loving people. 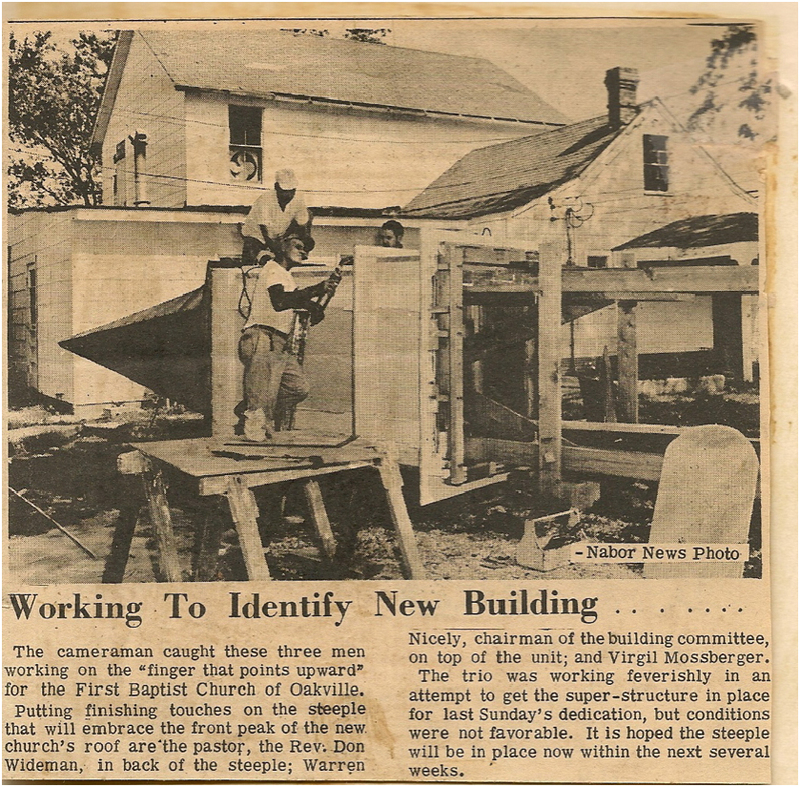 Picture as it appeared in the Neighborhood Link News September 18, 1963. Membership grew! Thirteen were baptized in 1961, thirty were baptized in 1962, and in 1965 thirty-eight were baptized. Mattese Baptist was used for the baptisms until the present church was built. The present building housing the sanctuary was built in 1962. 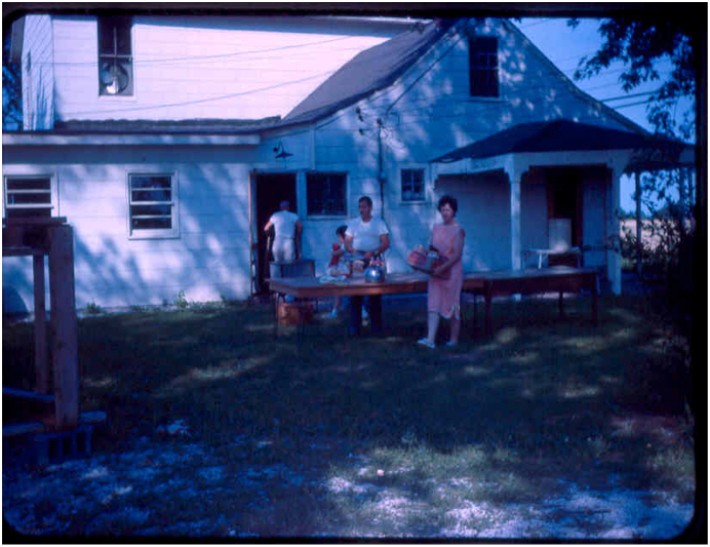 In 1963 the parsonage was built. In 1964 air-conditioning was added to the sanctuary and the church’s first pictorial directory was printed. An athletic program was started along with a church library. On April 25, 1965 a record attendance of 257 was reached. During Rev. Wideman’s pastorate, two men from the membership were ordained to preach and several young people trained as missionaries. However, Rev. Wideman wanted to continue his educaton, and in May, 1966 he announced his resignation. The church didn’t lose faith. He had left us with a challenge to go on. Dr. Herbert Haney was then called and served us faithfully. Under his leadership the transition took place peacefully. Our membership grew from 283 to 306 and baptized twenty-seven. Our present educational building was in the planning stages at this time. Because of Dr. Haney’s ill health, he had to resign after 14 months. The church had begun to get accustomed to change, so in spite of being without a pastor the building went on. The church had been organized eight years and served by three pastors. Janitorial work, choir work, secretarial work and most the building had been done as a labor of love by the members. By this time the farm house had been torn down and more classrooms were needed. They couldn’t quit now; a deadline was evident, but there was a search for a new pastor. In January, 1968 Rev. Gary Hawkins became the fourth pastor. He began with trying to locate all the missing members. In March an attendance of 200 was reached for the first time in over a year. The building of the educational wing was almost complete. Two floors had been built eventhough we needed just one. A few far-sighted members could see that it would be cheaper to have the additional top floor put on the building at this time and finished later. In August 1970 Rev. Hawkins left the church and once again we were without a pastor. The new pulpit committee was again at work, this time calling Rev. John King, the youngest pastor to serve our church. Rev. King came March 7, 1971. New programs were started, W.M.U. Was revived, building continued and growth again was well on its way. A newsletter was published monthly. Race relations were observed with exchange hospitality. A missions committee was established. The youth were encouraged to serve, and they did well. All this and much more was accomplished during the six and a half years he served as pastor. In February 1978, the church called Rev. Bill Shreve. We were will on our way again as he came in March to shepherd the flock. Meals were cooked and served by our ladies before each teachers and Officers Meetings, a prayer chain was originated, a Koch Hospital visitation ministry was reinstated, and the W.M.U., G.A.’s, R.A.’s, and Acteens were again on the move. Christian musical plays were put on by the children, home-bound outreach was started as was Children’s Church and Sunday evening Church Training. Some remodeling was also needed. The parsonage was revamped, one-half of the upstairs educational wing was made into classrooms, church offices, restrooms and dressing rooms. The other half became the Church Activities Center. The nursery was moved to its present location, and the youngsters could actually look out of a window at their level for the first time. Some remodeling also took place in the sanctuary. In January 1981, Ron Griffin was licensed by the church as a Minster of the Gospel and was called as Youth Director. In March 1986, Todd Buck became Music Director. 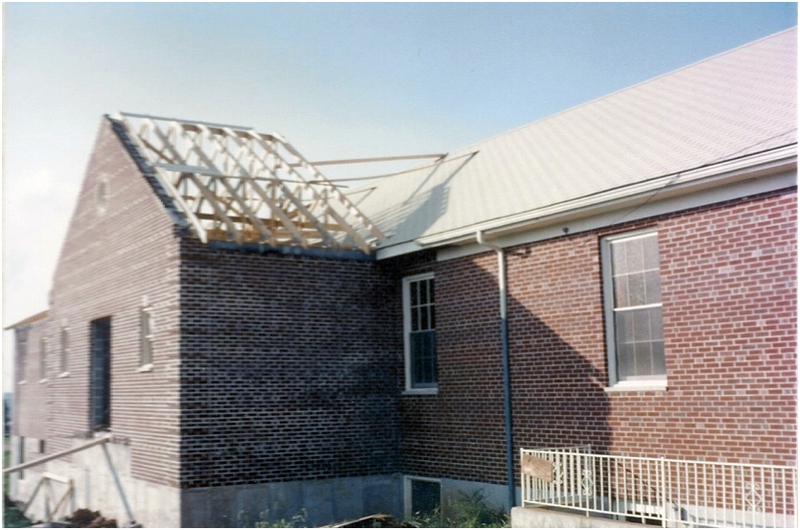 On February 22, 1987, the new Church Activities Center was completed and dedicated. 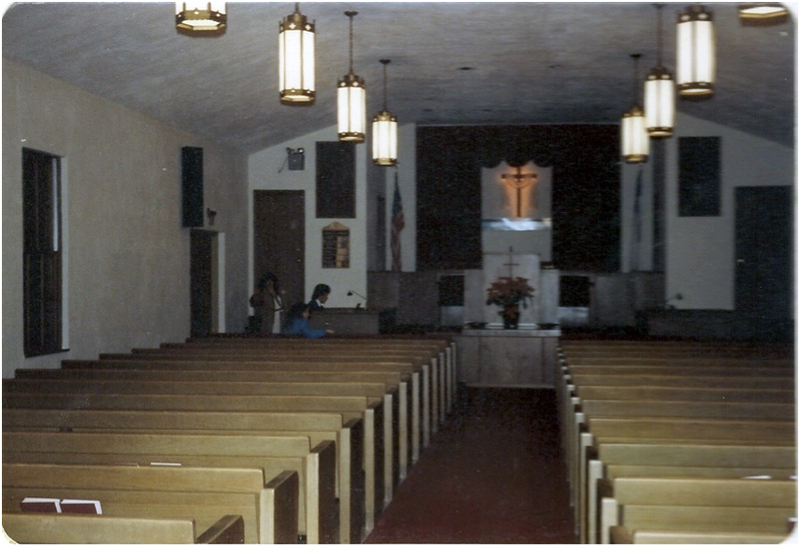 On October 22, 1989, the sanctuary was rededicated following extensive remodeling. The remodeling was necessary to repair damage caused by the overflowing of the baptistery. January 1990, Chester and Nancy Hemme were called as Music Director and Organist and Steve Banas was called as Director of Youth and Evangelism. Soon after, Steve was licensed and ordained by the church. After 14 years at First Baptist Church of Oakville, Bill Shreve resigned as pastor in January 1992. A pastor serach committee was organized in February 1992 and Dr. Dale Allen was called as interim pastor. In January 1993, Nancy Stanley, our present church secretary was hired. In February Dr. Roger Steenrod was called as pastor. Dr. Steenrod served as pastor for a little over a year and resigned in April 1995 due to health reasons. May 1995 saw the pastor search committee at work. During the seven months were we lead by the Lord and served by the State Association. Various men from the State Association supplied the pulpit each Sunday and the Lord lead us to Pastor Tim Richards. Pastor Tim began his 11-year ministry at Oakville coming from Macedonia Baptist Church in Rolla, Missouri. During the years that Pastor Tim was here several revivals were held during the fall, the parsonage was sold, Scott Kerby was called as part time youth pastor and the Little Angels Playgroup began meeting one morning each week. In November 1999, the church celebrated its 40th Anniversary. With a special day featuring former pastor Don Wideman as speaker. In October 2002, the church held its first Judgement House, a huge undertaking, with a large percentage of the church membership participating. Pastor Tim’s final sermon at First Baptist was preached on November 26, 2006, exactly eleven years from his first sermon on November 26, 1995. He has written a letter for this history that appears on the next page. First Baptist Church attempted many things over the course of the eleven years I served as pastor. To be honest, some worked, many didn’t. However, the ultimate point of what a church does isn’t the ministries it begins that survive, or even the participation of its members, but whether a congregation furthers the kingdom and whether those who attend become more godly followers of our Lord. A couple of particular periods come to mind. Shortly after I became pastor we did an emphasis called, “Shaping the Future.” It involved an evaluation of what the church was currently doing and a time to dream about what the future would hold. Another similar emphasis was “Forty Days of Purpose.” Both of these provided an opportunity to evaluate where we currently were and to consider God’s mission for the future. We began a number of ministries that continue to bless those who are involved today. Our ministry to senior adults expanded while I was pastor. We began monthly seniors meetings as well as providing transportation for the delightful residents of South Gate. On the opposite end of the age spectrum we also began a new ministry to children on Wednesday nights. Kids College touched kids from the beginning and continues to bless young families today. The youth ministry also grew substantially while I was your pastor. I continue to see that as one of our most far reaching high impact ministries. Far too often Christian teenagers walk away from their roots when they graduate. However, a majority of the teens I’m familiar with have remained true to God’s call and we have a significant number who are now either in Christian ministry, or are training for full time Christian service. Most of these ministries happened because of the hard work of others in the congregation. All churches, including First Baptist, in the final analysis, exist not for their own benefit but to fill a role in God’s kingdom. Not every ministry does what we think it will and not every one of the more than 1,500 messages or Bible studies I led accomplished what I wanted it to. However, I discovered in my time with you that God often uses our imperfect efforts to bring us and others closer to Him in spite of ourselves. At First Baptist I experienced some of my greatest joys and went through a time of personal testing I never thought I would have to endure. Along the way I was blessed with special friendships that I will always treasure and a boatload of wonderful memories that still occupy a special place in my heart. I am grateful we had the opportunity to share eleven years of ministry. I celebrate with you fifty years in the life of the First Baptist Family. May God bless and use First Baptist even more in the future than He has in the past. The pastor search committee recommended and the church voted to call John Hessel as interim pastor on January 1, 2007. In March 2008, Easter Sunday, John began his time as pastor of First Baptist Church of Oakville. Although this booklet shows the first fifty years of the building and making of the First Baptist Church of Oakville, it is not the ending by far. We are sure with one theme in mind, JESUS CHRIST, and with God’s guidance through the Holy Spirit, we will be able to accomplish many more great things for the Glory of God. If we had tried to list everything that the great saints of this church accomplished up to this date, there would not be enough pages to list each and everyone’s many endeavors which led to the building of this church family at this time and date. Each one that has passed through this place has contributed something. All leave a memory! Let us continue to hold high the banner of our church motto “The Church that Cares”. According to the information available to us. First Baptist Church is a faith family of people just like you. When you visit you’ll find friendly faces, practical messages and excellent ministries for every member of your family.